Postseason bound! Saturday evening the Yankees officially clinched a spot in the 2018 postseason with a 3-2 walk-off win against the Orioles in eleven innings. The Blue Jays beat the Rays earlier in the day to help the Yankees out. At worst, the Yankees will be the second wildcard team. The magic number for homefield advantage in the Wild Card Game is now seven. Real Talk: Lance Lynn starts are just as painful as Sonny Gray stats, except Lynn is a tad better at getting outs. He labored through five innings against the Orioles — the 2018 Orioles — on Saturday and finished with two runs and nine baserunners allowed. Lynn also benefited from two runners being thrown out at the plate and another being caught stealing. So the O’s made a full inning’s worth of outs on the bases while Lynn was on the mound. Geez. The Orioles scored their first run on a play that was equal parts bad, dumb, and weird. With runners on the corners and one out in the third, Cedric Mullins hit a weak tapper back out in front of the plate, and Lynn and Gary Sanchez did the “I got it you get it” thing. Sanchez picked it up, rushed the throw, and it sailed wide of first base. But! 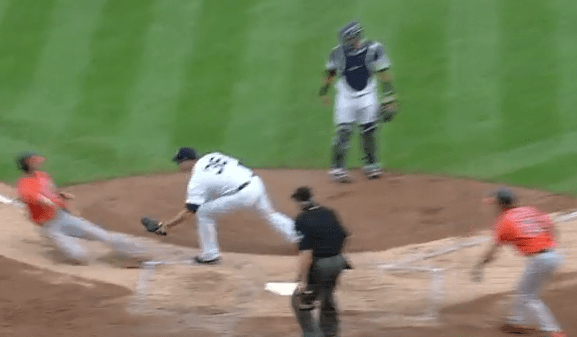 Gleyber Torres retrieved the ball in foul territory, threw home, and Steve Wilkerson was tagged out … by Lynn? By Lynn. Huh. Sanchez committed a passed ball that put a runner on third with one out in the first place, then he threw wide of first for an error, and then he got caught watching the play and Lynn had to make the tag at the plate. Not your best inning, Gary. Anyway, a run scored on the play and the play at the plate was the second out. Lynn was able to get the third out and strand the tying run at second. In the fifth, the Orioles scored in a more traditional way. Wilkerson doubled and Caleb Joseph singled to right, and Aaron Judge threw Wilkerson out at the plate. Poor guy was 0-for-2 going home on the afternoon. Two things about this play. One, Judge’s throw from right field was 96.9 mph, which is pretty nuts. I guess the wrist is feeling good. And two, replays showed Wilkerson never actually touched the plate. Sanchez blocked it with his foot. Cool. Lynn’s final line: 5 IP, 7 H, 2 R, 1 ER, 2 BB, 4 K on 93 pitches. Five consecutive batters reached base against him in the fifth inning, yet Aaron Boone stuck with Lynn with the bases loaded and two outs, and he got the ground ball to third to escape the jam and keep the score tied 2-2. Lynn had eight swings and misses among his 93 pitches and three came in one at-bat, when Joseph swung and missed at the same inside two-seamer three times. Was this Lynn’s last start of the year? He’s not going to be in the postseason rotation should the Yankees advance to the ALDS, so they may move him to the bullpen during the regular season’s final week in preparation for his postseason role. Normal rest would allow him to pitch Thursday, and then he could squeeze in one more tune-up outing Sunday. I guess we’ll see. Lynn was not all that good Saturday, but it could’ve been worse. The Yankees put eight men on base in five innings and still had a weak showing offensively against rookie righty David Hess, who went into Saturday’s start with a 5.22 ERA (5.68 FIP) and 19 homers allowed in 91.1 innings this year. Hess did not have a single 1-2-3 inning yet somehow the Yankees only had two runners in scoring position in his five innings. Miguel Andujar had a one-out double in the fourth and Andrew McCutchen and Judge drew back-to-back one-out walks in the fifth.
? The first three batters of the third inning had base hits for the Yankees. Hicks homered, Andujar singled, Voit homered. Voit’s home run was a solo shot because Andujar was thrown out trying to stretch the single into a double. Replays made it look like Andujar thought the ball was clearly into the right-center field gap, but Adam Jones got to it quickly and made a good throw to second. By time Andujar picked up the pace, it was too late. Still love ya, Miggy. Both clubs went to the bullpen after getting five innings of two-run ball from their starting pitcher. First out of the bullpen for the Yankees: Chad Green. He was able to pitch around a leadoff double and a two-out walk in the sixth inning. Closer-turned-seventh inning guy Aroldis Chapman struck out two in a scoreless seventh. His fastball velocity was way down (96.1 mph average and 98.3 mph max), though, after a month-long layoff, I’m sure he’s still rebuilding some arm strength. Hopefully he gets back into the triple digits next week. The Orioles, meanwhile, went to Miguel Castro. He tossed a scoreless sixth and seventh innings even though the Yankees had a runner on third with one out in the seventh. Gleyber Torres doubled to left and moved up on a passed ball, then was cut down at the plate on the contact play on McCutchen’s grounder to third. I hate the contact play so much. I mean, I get it, force them to make the perfect play. That’s why teams do it. I just hate it. Especially with Judge due up. And, even if they intentionally walk Judge, you’ve still got still Didi Gregorius at the plate with runners on the corners. Bah. How important was this game? Important enough that Dellin Betances got the call for the third straight day. First time all season he’s pitched back-to-back-to-back days. Relatively low pitch counts Thursday (16) and Friday (11) helped make it possible. Dellin struck out the side on 19 pitches. He extended his AL record to 44 straight appearances with at least one strikeout and is five games behind Chapman (2014 Reds) for the all-time record. Probably not enough time to get there this season. Oh well. Unseen in that video is Hicks fouling a pitch directly into his left ankle two pitches prior to the walk-off double. It looked pretty brutal. He was in obvious pain and stayed on the ground for a while before successfully lobbying to stay in the game. Then, two pitches later, he doubled into the corner (on the fourth slider of the at-bat) to send the Yankees to the postseason. Gregorius set that up with a leadoff single. Hot damn that was fun. Man, what an escape job by Jonathan Holder in the tenth. He allowed a leadoff double and then a weird infield single where Voit got caught in no man’s land, and Holder couldn’t beat Jonathan Villar to the first base bag. A grounder right at Gregorius (infield in), an intentional walk to load the bases, a line drive at Voit, and a pop-up to Torres got Holder and the Yankees out of the inning. The O’s went 3-for-15 with runners in scoring position on the evening. 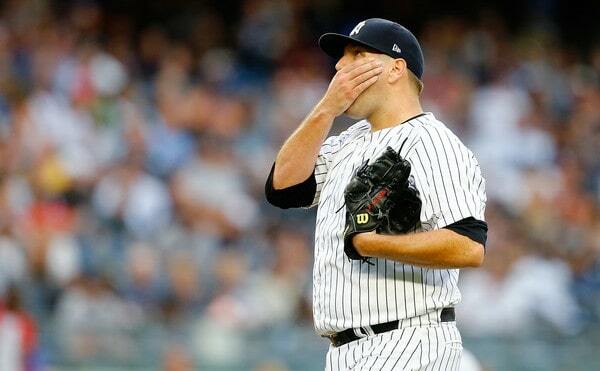 The Yankees did a whole bunch of nothing against Baltimore’s bullpen. One hit in five innings before Didi and Hicks teamed up for the game-winner. 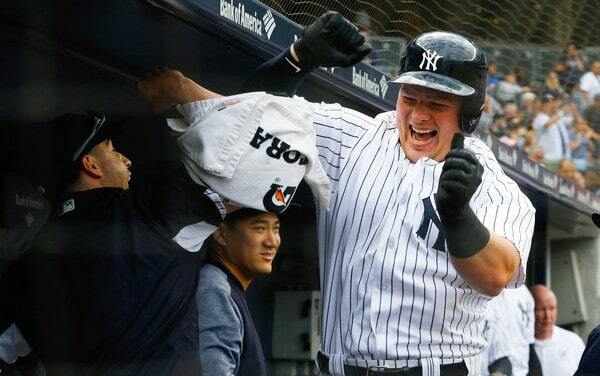 In fact, after Voit’s home run in the third inning, 26 of the next 31 batters the Yankees sent to the plate made outs. This was the opposite of Friday’s game. Friday night neither team could find a reliever who could get outs. On Saturday, everyone got outs. Speaking of the bullpen: 6 IP, 5 H, 0 R, 2 BB, 9 K combined from six relievers. Green, Chapman, Betances, Zach Britton, Holder, and Tommy Kahnle each threw a scoreless inning. Sonny Gray was warming up when Hicks walked it off in the 11th, so he was the next man in the game. Great work from the bullpen, especially Holder, who escaped that massive jam. Can the Yankees hit 14 home run in their final eight regular season games to break the record? It’ll be tough since four of those eight games will be played in Tropicana Field, which isn’t exactly known for giving up home runs. A good five-homer game Sunday would really help the cause. The final home game of the 2018 regular season. Time flies, man. Veteran lefty J.A. Happ and veteran righty Alex Cobb are the scheduled starters for Sunday afternoon’s series finale. That’s a 1pm ET game.